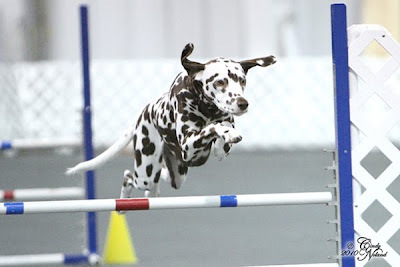 Here are a couple new agility photos of Jazz, taken at the CPE trial over the New Year. What cracks me up is how serious Jazz looks in all these pictures. When Tess runs, she has a twinkle in her eyes and a smile on her face, but Jazz is all business! 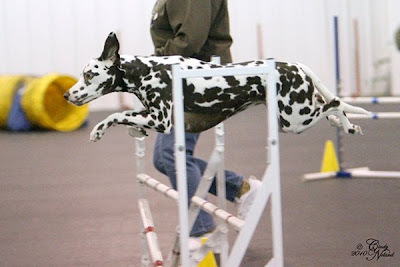 Like Tess, the little brown girl loves to jump, and she had a lot of fun on these courses. Jazz ran so well for me at this trial that we're going to try a couple USDAA runs in mid February. The difficulty level is definitely higher in USDAA, but Jazz has been consistently running well for me lately and we're ready to give it a try! The video above is of Tess and Jim's Jackpot run on New Year's Day. 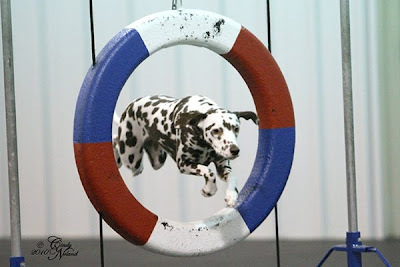 For those of you not familiar with Jackpot, there is an opening period where you do obstacles to accumulate points, and when the whistle blows, the dog and handler must complete the Jackpot sequence, which is done at a distance (there is a piece of orange tape on the floor that the handler cannot cross). In this case, the Jackpot was a wicked sequence of tunnel, angled set of six weaves, then into another angled set of six weaves, and to the table (all of which must be completed in the allotted time period, or you lose ALL your points). It sort of looks easy on the video because of the camera angle, but many dogs and handlers did not complete the sequence properly. Jim and Tess did an awesome job! Next up is Jazz's Standard run with me. She really ran nicely and did very well until I got dazzled by her performance and forgot about my front cross after the A-Frame (oops) and then I didn't realize how far out Jazz would land after the tire and didn't call her back in time for her to get on the dogwalk easily. Despite my poor handling, Jazz qualified with second place in this run! In fact, Jazz qualified and placed in all four of her runs over the weekend, but most importantly, she ran happy and seems to have gained some confidence. Tess also did well, qualifying and placing in 13 of her 17 runs over the four days. Our adopted Border Collie Sammie had a perfect weekend, qualifying in all eight runs on Saturday and Sunday (as well as many qualifying runs on Thursday and Friday)! Sammie had a terrific time running with his Mom again, although Jim helped out some, too. He just loves revving up that Ferrari!! Over the New Year's holiday, we stayed out in Ohio for a four-day CPE agility trial with our friends Mariann and Jim and their two dogs, Rocky and Sammie, in a wonderful two bedroom suite, complete with fireplace! Now, this may not look like love, but Jazz adores Sammie, and they happily spent their evenings at the hotel playing and wrestling. 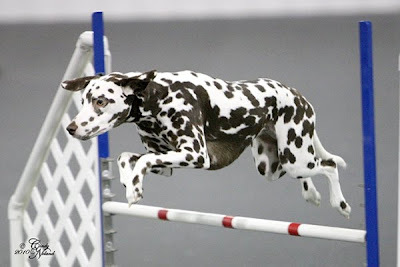 Despite the violent appearance of these photos, no Dalmatians or Border Collies were harmed!! Rocky, who is over 13 years old, decided to leave the frolicking to the young kids and stayed on his cozy bed in the bedroom during the wrestling matches. Smart boy!